Unification Church Japan Headquarters: In December, a circle of joy and gratitude continued to spread even further through Holy Blessing Ceremonies held in all parts of Japan. The following reports cover the ceremonies carried out in five parishes of West Kanagawa, South Nagano, West Shizuoka, Tama Tokyo and Igaraki. On December 7th, amidst cool winter air and blue sky, ‘2015 Cosmic Blessing Ceremony by True Parents of Heaven, Earth and Humankind’ (hereafter, Blessing Ceremony) of the West Kanagawa Parish was held in a hotel in Odawara city, Kanagawa. It was officiated by Rev. and Mrs. Jun Ju Bong, Director of Region 6 for 112 couples including 94 previously-married couples and 18 pairs of single members. During the banquet, the participants enjoyed their conversation with joy and gratitude in warm atmosphere. After three groups set the stage alight with songs and dances, the officiator presented gifts to the participants. The ceremony closed with four cheers of Eok-mansei. One of the male participants called out to his wife, “I renewed my determination to care for my beautiful wife, so let’s go together harmoniously!” Another male participant said, “I feel good! This day has become a memorial day!” For the participants, the December 7th became a very memorable day indeed. On December 7th, the Blessing Ceremony was held for the second time in South Nagano Parish at the Matsumoto Church. It was officiated by the South Nagano Parish director, Rev. and Mrs. Cho Jin Seob for a total of 36 couples including 5 previously married couples as well as 31 pairs of single members. The total number of couples blessed this year, including couples who attended church-level Blessing Ceremonies and those who attended the Cosmic Blessing Ceremony held last June, has reached 107. At the luncheon banquet immediately following the ceremony, the participants enjoyed a chorus by intermediate and high school students, a male chorus and a solo by a soprano singer. The ceremony was filled with grace. On December 7th, the Blessing Ceremony of the West Shizuoka Parish was officiated by West Shizuoka Parish director, Rev. and Mrs. Lee Beom Seok in a hotel of Hamamatsu city. A total of 70 couples including 7 previously-married couples and 63 pairs of single members participated. Adding the 33 couples blessed earlier in June, more than 100 couples were blessed this year. Then, the Holy Water Ceremony was followed by the affirmation of Blessing Vows and the officiator’s congratulatory message. When the officiator made the pronouncement of marriage, the floor was filled with generous applause. The ceremony closed with four cheers of Eok-mansei by Rev. and Mrs. Lee. On December 13th, officiated by Rev. and Mrs. Eiji Tokuno, President of Unification Church of Japan, the Blessing Ceremony of the Tama Tokyo Parish was held in Hachioji city. It was the first Blessing Ceremony held in Tama Tokyo Parish this year. A total of 82 couples including 20 previously-married couples and 62 pairs of single members were newly blessed. Rev. Tokuno stated: “You have obtained the passport to heaven through Blessing. But whether or not you can acquire the visa to stay in heaven depends on your lifestyle. In order to build a happy family, you must share joy, sorrow and worries with your spouse. You must change yourself before demanding your spouse to change!” He gave some tips on becoming a happy couple. At the ensuing celebration party, some of the couples representing the previously-married couples and the single members shared their reflections. Among them, a lady who had her 92 year-old grandmother attend the ceremony stated: “Ever since my grandmother lost her husband in the war at the age of 27, she raised her children by herself. I was born because of her. Today is like my birthday, so I brought her along from the Yamanashi prefecture to offer this Blessing as a gift for her. This day became the most memorable birthday for me, too.” The participants were inspired to see the grandmother put her hands together as a sign of gratitude. On December 14th, the Blessing Ceremony was held at the Tsuchiura Church. It was officiated by the Ibaraki Parish director, Rev. Jung Tae Suk and his wife for a total of 78 couples including 10 previously-married couples and 68 pairs of single members. 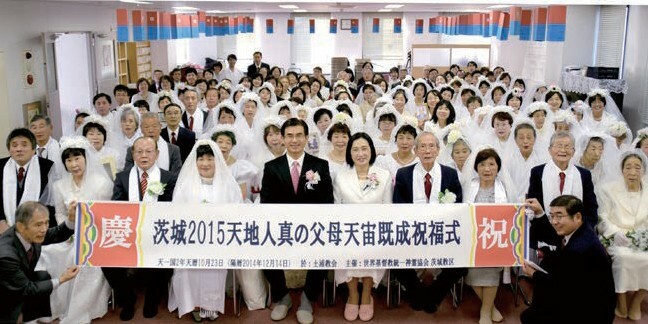 This became a step forward for the “Ibaraki Parish 1,200 Couples Blessing” to be held on November 13, 2015. The officiator Rev. Jung said, “Through Blessing, the original sin inherited through the blood lineage since the Fall of Adam and Eve has been cleared and your blood lineage has been transformed from evil (Satan) to good (God). You have started off as eternal husband and wife centering on God”. He emphasized the meaning and value of Blessing. In this Blessing, ministers visited houses of candidates who could not attend Blessing due to physical challenges. Also, there was a case in which a lady sprained her foot on the day of Blessing and was carried on her husband’s back to attend Blessing. When she arrived at the Blessing venue, the pain was gone as if nothing had happened!